Here’s something a little fun for today. Let’s analyze a real bottle of Coco Mademoiselle against a fake bottle of Coco Mademoiselle. Keep in mind that we will be working from a limited pool of images and information. The purpose of this post is to get you used to seeing signs of a fake bottle, not to dissect what makes a particular bottle fake. 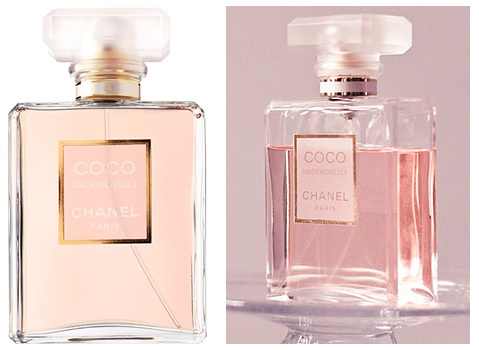 These are authentic bottles of Chanel’s Coco Mademoiselle. Take the time to look at the details, pay attention to the craftsmanship, and the little elements like the logo, spacing of the characters on the label, the quality of the glass, the types of materials used, the information on the label, and so on. And if you were to go buy an item like this on eBay go out of your way to scrutinize an authentic item first to get yourself used to its details. I know Coco Mademoiselle is an extremely popular fragrance. Its youthful, fruity floral oriental scent has captivated the noses of a great deal of young consumers and the Chanel label only hooks them in further. 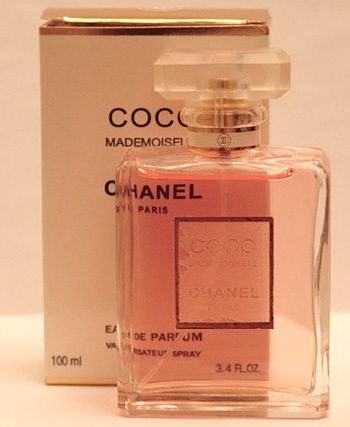 So naturally, Coco Mademoiselle is prone to a tremendous amount of counterfeiting to the point where people selling old bottles that they believe to be real, aren’t. There are a lot of good dupes out there too, so it’s important that you know what to look out for. Thankfully, most of the fakes are easy to spot. Like the one we’re talking about today. This one didn’t take long to find. It was on the first page of eBay when I plugged “Coco Mademoiselle” into the search bar. In fact, it was being sold by three “different” sellers. Two of which had zero feedback and joined less than a day apart. The third had six feedback–all positive (feedback is not always 100% accurate, especially if a seller has very little feedback). The seller or sellers claimed one bottle was brand new in box, while the other two were slightly used. While I have said in the past that you are safer buying used than brand new in box, you are not always guaranteed to be safe. This is one instance where the seller is trying to make it look like you’re getting a mostly full bottle for a good price because 5% used of an expensive fragrance like this is nothing to cry over if you’re paying a deep discount. – The first thing I noticed was the shape of the interior of the bottle. Scroll back up and look at the authentic Coco Mademoiselles. Notice how the interior vessel is shaped on the real bottles. The vessel should be a straight and perfect rectangle until it reaches the bottom where the vessel domes up. Everything on the real bottles is symmetrical. Looking at this fake, we notice there’s a clear deformity on the interior vessel, making it wavy and there’s a noticeable lack of a dramatic dome at the bottom. This particular specimen has a domed bottom, but it’s imperfect, crooked, and sloppy. This is actually one of the easiest ways to tell a fake Chanel from a real one as making a perfect replica of the real bottle and having it be perfectly symmetrical is somewhat challenging. Chanel’s interior vessels very often have a symmetrical dome at the bottom. If there is no dome, or the dome is off-centered, lumpy, or set too high then it’s probably fake. – Second thing I noticed was the label that looks like it’s been damaged in some way. If this were truly a new bottle shipped in box, there wouldn’t be any deformities. Remember my earlier post about companies and their stringent branding practices? Chanel, of all companies, would never let a defective bottle like this see the light of day on the consumer market. Their brand is about quality and luxury. What does it say about them if they shipped a product with a scratched up label like this? They probably wouldn’t. – The logo on the band that runs along the cap’s neck is too large and appears to be somewhat stretched vertically. On an authentic bottle of Coco Mademoiselle, there is a bit of white space above and below the logo. On the fake bottle, the logo is flushed against the gold bands. This is another easily identified foible. Many counterfeits get the tiny logo on the band wrong. Maybe it’s the inferior printing practices? Whatever it is, an imperfect logo on the band often indicates a fake. – A minor giveaway would be the bulge in the bottle’s cap. It looks a bit thicker than it should be. Though the one image we were provided doesn’t do us any favors because of its poor lighting and quality. If this had been a less obvious counterfeit, I would ask the seller for more photos. – The box looks a bit beat up, but it’s difficult to scrutinize it because there’s only one photo of the box and it’s being obscured by the bottle in the foreground. Another dead giveaway of a fake Chanel is the typography used on the packaging. Sometimes counterfeiters get the typography right, but the lines are a little bit too thick or too thin. A lot of times they get the typography wrong, making it obvious to a keen eye that something is amiss. This sort of scrutiny is harder to tell in seller photos, especially if the seller only has one photo of poor quality and the typography is being obscured by lighting, angles or props. – Finally, I would like to note that this one image was used for all three listings–including the new in box listing. Every time you see one image being used to sell a luxury item–especially when three different sellers are listing the same image, be instantly suspicious. Probably the scariest part of this was how many bids were put in for these bottles. The “Used” bottles had 7 and 10 bids. The “New” bottle had 5 bids. And this fake was very easy to spot. If this post proves useful or anyone is interested in more Fake Spotting, I’ll do more of them in the future. In the meantime, Dino 2.0 has a very thorough dissection of a real Chanel Coco Mademoiselle and a fake one. This entry was posted in informational and tagged fake spotting, info. Bookmark the permalink. Hi Jess, thanks for taking the time to comment :-D. Don’t worry if you aren’t used to spotting fakes now, it takes a little bit of time to get used to just identifying one bottle of perfume, and it definitely helps to have seen and held the real bottle in person. It also helps that I spend too much time browsing eBay for good deals! Thank you for sharing your experiences buying Coco Mademoiselle on eBay, Tina. I’m sorry to hear about the difficulties involved in it. One has to be so careful on eBay, it’s crazy how many dishonest sellers are out there!